It mixes the energy and swagger of punk’s golden age, the pop sensibility of The Kinks, and the stark, deliberate execution of Television and the eerie, insistent synth sounds of groups like The Normal and Suicide. 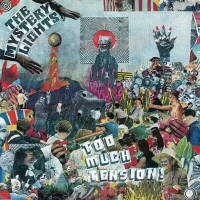 The Mystery Lights are taking their idiosyncratic brand of rock and roll to dizzying new heights. The Mystery Lights story begins in 2004 in the small town of Salinas California when friends Michael Brandon and Luis Alfonso -whose shared fondness for groups like The Mc5, Velvet Underground, Dead Moon, and The Fall (just to name a few) -decided to join forces and craft their own brand of unhinged rock and roll. From there they spent the better part of 10 years touring relentlessly before migrating to Queens, New York in 2014. With a live show known for its raw, visceral energy and relentless assault –leaving little to no stoppage between songs –they barreled through countless NYC haunts and DIY venues, quickly amassing a fervent local following. The buzz soon caught the attention of Daptone Records execs who were in the beginning stages of launching a new rock-centric imprint, Wick Records. Impressed by the groups’ musicianship, groove, endless supply of energy, and understanding of musical history the Mystery Lights were quickly signed to Wick. Though a rock band at heart, the parallels to what Daptone Records had traditionally looked for in their Soul artists was undeniable. Soon sessions were booked with Producer/Engineer Wayne Gordon, and the release of their debut single “Too Many Girls” b/w “Too Tough to Bear” launched to mass critical fanfare.